Getting your child to develop a healthy teeth brushing routine is difficult. Even as adults, we don't brush as often as we should. Playbrush is a gadget that turns that twice daily chore into a video game. It's a rubber base that you stick the end of your toothbrush into. 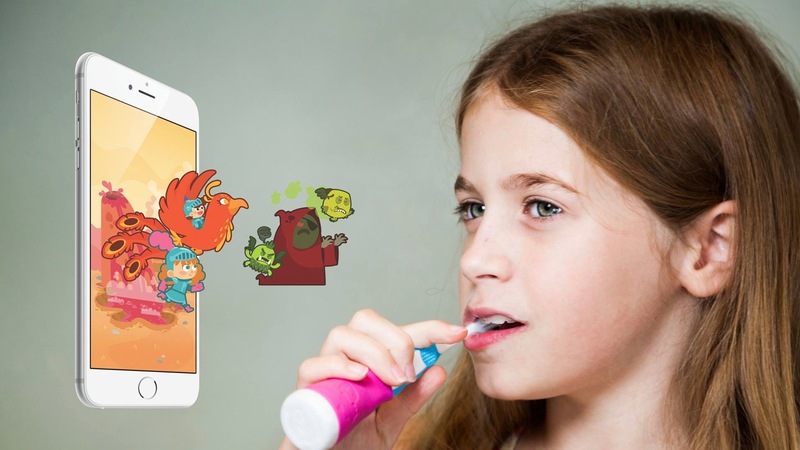 It connects via Bluetooth to any compatible smartphone or tablet and turns it into a controller that your little ones (or you) can use to play the brushing game, literally. Sensors inside the base measure brushing behavior and send the data to the connected device providing real-time feedback in the form of games. In the game, Utoothia, which is available on iOS and Android, players (also known as brushers) are tasked with helping the Tooth Fairy get her crown back from the evil Plaksta. When you brush, you'll shoot down Plaksta's minions and unlock hidden rewards. The game is designed to keep you brushing for two minutes, twice per day. The company has plans to release new Playbrush compatible games in the future. The base is detachable, so it can be used by multiple family members, as long as they aren't trying to brush their teeth at the same time. The Playbrush comes in blue and pink and costs €49.00 for one or €83.30 for two. If you don't have a smartphone holder to keep your device secure while your little one brushes away, you can order the Bathroom Kit (free for a limited time), which comes with a vinyl pocket that sticks to your mirror using suction cups. Now, you … (um, we mean your kids) have no excuse for not brushing.